Summary Four bay, high-performance BYOD SATA NAS with many features based on a dual-core Intel Atom D2700 processor. As much as Synology likes its expandable/scalable NAS business, some folks like to save some dough and take their four-bay NASes without the option for adding expensive expansion cabinets. 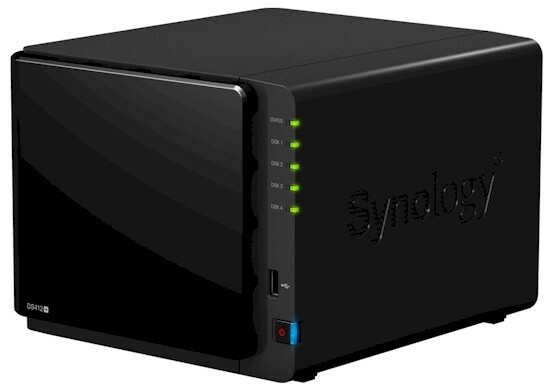 For them, Synology has its new DS412+, which is positioned one step from the bottom in its "Standard Business" NAS line. As noted in the article teaser, you can think of the 412+ as a non-expandable four-bay version of the DS1512+ [reviewed], at least from a hardware architecture point of view. Construction-wise, the two are very different animals, however. Where the DS1512+ comes in a metal case with lockable drive trays, Synology has turned to plastic for all of the 412+' external construction. While this might help to keep cost and vibration-related noise down, it seems a bit chintzy for a ~ $625 NAS designed for business use. The front cover attachment method using four rubber "packs" and a friction-fit is novel and should be buzz-free. But it again smacks of design-for-reduced-manufacturing-cost vs. long-term robustness. Like the DS1512+, the 412+' drive trays are plastic, but they can't be key-locked in place. 2.5" or 3.5" solid state or hard SATA drives are screwed to the trays and the trays themselves are held in place by plastic latching mechanisms. You can see photos of the cover, drive tray and construction details in the gallery. View of drive bay with cover removed. The plastic drive trays slide right on the drive bay metal floor and top. View of the front cover being installed. The cover stays on with a friction fit from four rubber bushings. The plastic drive trays have mounting holes for 2.5 and 3.5 inch drives. They are held in place by the plastic latches shown in the first picture. The callout view below provides the rundown on ports, indicators and switches. Like the 1512+, there are no VGA or HDMI ports to support an attached console, nor is there an LCD status panel on the front. You'll have to get any information you want via the front panel LEDs or logging into the web-based admin. The two 10/100/1000 Ethernet ports on the rear do not have built-in link/status LEDs, either. For drive and printer attachment you get two USB 3.0 and one eSATA ports on the rear panel, one USB 2.0 port on the front. The 412+ is the polar opposite of the 1512+ for serviceability. The two fans look like they can be removed without opening the case. But if you remove the four screws holding one on, you'll find that you just removed a (yes, again) plastic grill and the fan falls off the plate into the box interior. You can remove most of the cover in one large C-shaped section by removing two rear-mounted screws. But the cover requires a tricky slide movement before you can get it off, which I discovered by accident after futzing with it for about 15 minutes. Once you get the cover off, however, good luck getting at the processor board. I couldn't get at one last screw securing the other cover and gave up before I broke something. It seems other reviewers were more skilled than I in getting the other cover off. techPowerUp has a nice set of inside pictures in their review, which is where most of the information in Table 1 comes from. Here is one of their photos of the 412+ main board. The two Gigabit Ethernet ports supplied by a pair of Intel WG82574L controllers can be set to aggregation, failover and separate LAN modes. The Silicon Image SiI3132 PCI Express (1x) to 1 Port SATA300 services the rear eSATA port. Two USB 3.0 ports are provided via an NEC D720200AF USB 3.0 controller. Power consumption measured 55 W with four WD RE4 2 TB 7200 RPM (WD2003FYYS) drives Synology supplied spun up and 18 W when the programmable drive spindown kicked in. Fan noise, in the default "Quiet" mode (the other two modes are "Cool" and "Low-Power") was barely audible and there was little idle drive noise in my quiet home office environment. So I rated the 412+' noise as low. The 412+ supports all the features in Synology's DiskStation Manager (DSM) 4.1 OS. DSM is probably the most graphically ambitious of the current NAS OSes, using a multi-windowed interface illustrated in the screenshot below. The DSM 4.1-2647 build used for testing has a very extensive feature list, which is described in Synology's DSM Highlight pages. See the DS1512+ review for a feature summary. You can also check out Synology's product datasheet.